So I installed latest Firefox today and first thing I noticed is the Cisco codec auto-plugin. Got rid of that for the moment, doubt I have a need for it. Then I noticed FF increasing my GPU temp by 20C even when I have it open to nothing but a "blank" page. Used to only do it when playing videos (reasonable). Yes I have the hardware acceleration setting disabled. Can't figure it out or if I can stop it from happening. Don't like that it's happening. (GPU monitor claims usage is almost non-existent to zero and CPU temps go up a little too but nowhere near as much). I don't think my GPU should be running 60C just to browse a forum/do a websearch. Anyone else have this w/FF? Is it just the way FF is now? Haven't noticed it personally, but the only obvious thing that comes to mind might be upgrading GPU drivers. Do the clock speeds change when you have it open? I'm presuming yes, since I don't see why it would increase the temperature otherwise if there's no activity increase, but just making sure. Edited by Bartimaeus, 19 February 2015 - 08:17 PM. I don't know but I just used a can of compressed air to clean the inside of my case, and boom, cooler temps, even the fan noise sounds different, better, happier. Even the CPU fan was clogged like a ************. I have the exact same problem with Chrome, but only for one specific site: imgur.com. After going through a couple of pages of imgur, the fans start spinning like crazy on my GPU (it has three of them so it's pretty audible) and the entire page becomes unresponsive and slow as hell. It's really weird and annoying. --Don't know about the clock speeds, didn't check that earlier. --I clean out the case/gpu of dust 2 to 3 times a year, it's pretty clean-ish. Me to myself: "I don't see how that could be related to the browser, but it has been a few months since I updated nvidia, so what the heck." ... (do so) .... "Well I'll be dipped in ...."
Anyway, thanks Humanoid, GPU driver wouldn't have occurred to me as a fix at all. That seems more like nvidia's fault, especially considering you said it was going to full clock speeds (I'm presuming that's what it was doing, since there's no other explanation for it gaining more heat) while watching videos, which isn't *usually* normal behavior - at least with even sort of new GPUs (I would say anything released in the last 5 years). It should only go to max clock speeds for 3D graphic displays, and none of that is 3D. An unusual problem. Edited by Bartimaeus, 20 February 2015 - 02:30 AM. Now that you mention it, I did notice an increase in GPU temperature lately but I just figured it's because I haven't opened my rig up and cleaned it in too long, but it correlates with updating my Firefox. I wouldn't know how hot my GFX is, it's not something I keep track of. If firefox somehow sets my GPU to 100% comperable to when it's idling in the bios, that would be bad. It's pretty noticable. Doubt many people do - it's usually just something you notice when the fan speed suddenly ramp up to maximum for no discernable reason. Yeah, same for me, got Speedfan on autorun these days. Can't discern whether or not Firefox is the issue though. 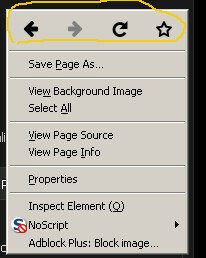 ...anyone know of a way to get rid of the back/forward/reload icon buttons in the r-click menu? Edited by Elerond, 24 February 2015 - 09:26 PM. I think y'all are forgetting what a modern GPU actually is: A stream processor or, massively parallel single instruction multiple data floating point ALU. Programmers are finally breaking out of the legacy mold and starting to see the GPU as something used only for CAD and gaming. If they're offloading something to your GPU then it is because either the compiler, or the runtime VM seems to think that it will run more efficiently there. Additionally, with the growth of languages like Haskell, F#, Golang and now Swift, it will become more commonplace. Don't discourage the attempts CS engineers at making better use of your hardware. If something is firing up your CUDA cores, its probably calling one of the API's that use it. Edited by Luridis, 12 June 2015 - 07:52 AM.